The object of this Model Code is to facilitate a safety evaluation of Medical Electrical Equipment (MEE) and Medical Electrical Systems (MES) to safety considerations that do not include requirements pertaining to risk analysis, evaluation of efficacy, or performance of products. 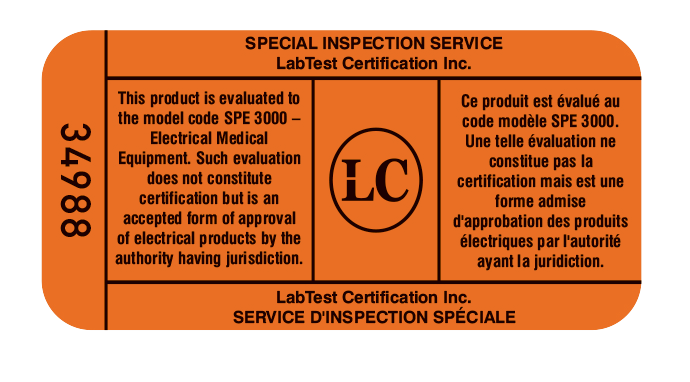 Our Special Inspections to CSA SPE 3000 for Canada offer a one-time approval for medical electrical equipment and systems that are required to meet Canadian CSA standards. We offer fast turnaround times that are very cost-effective. 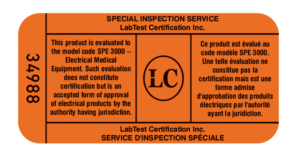 The LC label proves to inspectors that your equipment has met Canadian standards. Approved products will be labelled onsite.